La Barceloneta beach (Playa de la Barceloneta) is probably the most popular beach of Barcelona. 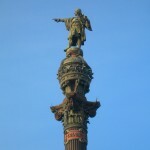 It is placed in the city touristic centre, at 5 minutes on foot from La Rambla and Columbus Monument. 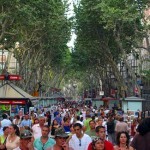 Also, La Barceloneta is the name of the marine neighborhood which occupies the area around the beach. This historic neighborhood was designed and built in the XVIII century, taking the ground from the sea. To arrive at La Barceloneta, you can take the metro (Line 4) until Barceloneta Metro Station or Ciutadella – Vila Olímpica Metro Station. – The beach (Playa de la Barceloneta): As Barcelona has a warm climate; its beaches have many people during all the year (except maybe in winter). Frequently, most of the people who go there to have a bath, swim and sunbathe are tourists. That is because the citizens of Barcelona prefer to go to other places where there are fewer people. 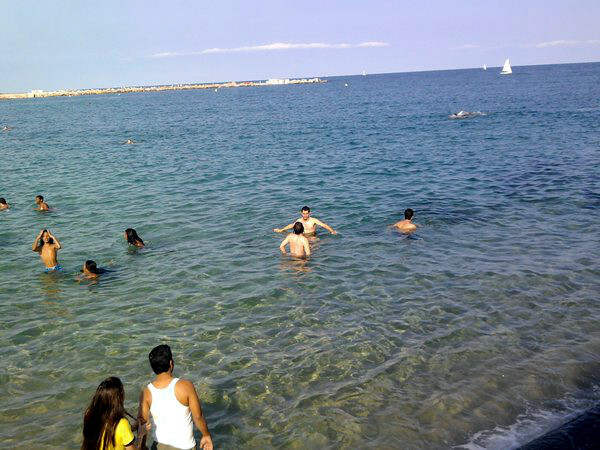 However, we highly recommend to visit La Barceloneta beach and its surroundings, surely you will enjoy it. 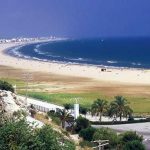 – Ronda Litoral and the seafront: This avenue starts in Barceloneta Metro Station, near the old port and Marina, and goes along the beaches which are in this part of the city. – Marina / Port Vell: A nice place to see the sea and the ships. Also in there you will find some restaurants and cafes. 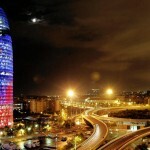 – The olimpic port of Barcelona: The olimpic port is placed between La Barceloneta and “Nova Icaría” beach. – Maremagnum: This commercial center is located between Colón Monument and La Barceloneta (Moll d’Espanya del Port Vell), just above the sea. In there, you will find shops, terraces, discotheques and a lot of hobby activities. – The Aquarium of Barcelona (l’Aquarium): The aquarium is in the same location than Maremagnum Comercial Center. They have almost 4 millions tons of water in their pools, where you will be able to see the best of the Mediterranean Sea.